The pancake tortoise is by far the oddest and most interesting amidst chelonians. 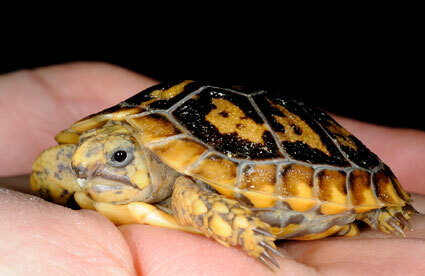 These small flat shelled tortoises are found in regions of eastern Africa especially Kenya and Tanzania. Its name has been inspired by its thin, flat shell. These animals are excellent climbers and unlike other tortoises they do not withdraw to their shells when attacked by predators. Instead they flee to their rocky homes that are usually in narrow rock crevices. This particular type of tortoise is the only living member belonging to the genus Malacochersus. The pancake tortoise is attributed with features and characteristics that are extremely unusual from that of a regular tortoise or the chelonian group. This species is recognized by its thin, flat and flexile shell which is extremely rare for tortoises. The make of its shell is what associates the unique characteristic of fleeing instead of withdrawing back to its shell, to the pancake tortoise. The shell measures approximately 17.8 centimeters in length. Moreover unlike the shell bone of other tortoises, the pancake tortoises’ shell bones have several openings that make it way lighter and nimble than the rest. It is the light weight of the shell that allows these creatures to escape from predators that otherwise can tear apart its fragile shell. Moreover the flexibility of the shell makes it extremely convenient for them to crawl into narrow hideouts or rock crevices. The top shell or the carapace is generally brown in color. It is further divided into several shell plates or scutes. 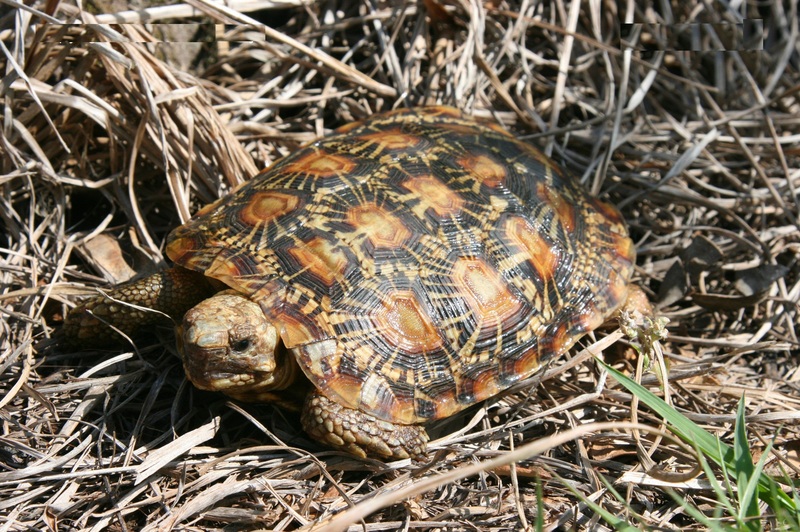 A variety of patterns consisting of dark radiating lines adorn each shell plate thereby, allowing the tortoise to camouflage itself easily to its natural dry habitat. The bottom shell known as the plastron is pale yellow in color and has dark brownish seams and light yellow rays. The top shell or carapace of baby pancake tortoises are more domed than compared to the carapace of the adults. Males and females can be distinguished by their size and length of their tails. It is the males who generally have bigger and longer tails. However males are comparatively smaller in size. The head, tail and limbs of this creature is basically yellow brown. Generally these creatures are found in rocky hills and outcrops of the arid scrubs approximately 100 to 6000 feet above sea level. One can spot them in the dry savannahs or flat grasslands home to tropical and sub tropical areas. They are specifically familiar in hillsides characterized with rocky outcrops or kopjes of the arid scrub. Pancake Tortoises are also observed to inhabit semi arid deserts with scarce vegetation. The particular kind of tortoise is native to regions of Kenya, South Eastern Africa and Tanzania. It is specifically the East African pancake tortoises that are found in southern Kenya, the northern and eastern parts of Tanzania and parts of Zimbabwe. These species can also be spotted in certain parts of Zambia. These tortoises feed on dried grasses and other vegetation. However people who keep them as pets can also give them greens, vegetables and freshly cut grasses to eat. These animals do not consume any kind of fruits. Pancake tortoises are rightly regarded to be the oddest amongst all kinds of tortoises. The make and structure of this creature enables it to be excellent climbers. Its shell is designed to be extremely light and flexible allowing it to crawl into rock crevices as quickly as possible if caught in a dangerous situation. As such unlike other tortoises the pancake tortoise does not withdraw back to its shell in a scenario where it is attacked by predators. These creatures are always found nearby their rocky homes. As such even attacked by a predator they can easily flee back to the nearest rock crevice. Pancake tortoises prefer to dwell in colonies that are usually isolated from each other. A number of tortoises could be sharing the same rocky outcrop or a crevice. Pancake tortoises do not hibernate. However they do aestivate or sleep under flattened rocks during the hot summer months. Their breeding season lasts from January to February. There is tough competition between the males to get a particular female for mating. It is often the larger males that win over the situation and get ample chances to mate. Nesting occurs from July till August. The females lay eggs that are approximately 2 inches long. Nest cavity is built by the female in loose sandy soil. The female will lays one egg at a time but she will be capable of laying several eggs in the cycle of one season. A break of 4 to 8 weeks is generally observed in between laying the eggs. The eggs are incubated at a temperature of 30 degree Celsius. In captivity there is no specific breeding period for these species as they can breed any time of the year. 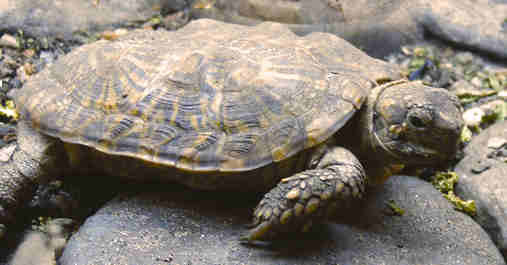 Pancake tortoises can live up to 25 years and sometimes more in captivity. Many people have liked the idea of keeping these small tortoises as pets. The animal is innocently interesting and it size is a plus point for those living in small apartments with limited space. You are recommended to arrange for the following requirements for your little pet friend. These reptiles attain a size of about 6 inches when adults. As such a vivarium measuring somewhere around 2 feet by 4 feet, will be the ideal dwelling for these creatures. The ground surface of this enclosure should be kept dry. Big flattened rocks and bark sections of corks could turn out to be handy in creating a variegated landscape for your pet friends. These tortoises will love a diet comprising of fresh grasses, a few greens and vegetables. However please note that they do not feed on fruits. These species are familiar with day -to-night temperature fluctuations in the high altitude areas where they reside. Therefore it is important to subject them to similar type of temperature fluctuations in the enclosure. During the night you are recommended to put off the heat sources except when recorded temperatures remain 60s F. However a temperature of mid 80s F would be ideal for the daytime. These tortoises do not hibernate. However it is recommended to subject them to a temperature of 5 to 10 degrees during the winter time. You can promote a successful breeding environment for these species by keeping a group of these reptiles in a large enclosure. It is always better if the group has been collected from the same area to which they belonged earlier. A temperature of 80-88Degree F is ideal for the eggs to hatch. The pancake tortoise is the oddest and the most interesting among all tortoises. Unlike other tortoises the pancake tortoise has a thin and flat outer shell. This shell is extremely fragile and can easily be torn apart by its predators. This tortoise flees to its rocky homes in crevices, instead of withdrawing into its shell, when it senses danger. Pancake tortoises are excellent climbers, aided by the light their light and flexible shells that allows them to squeeze into narrow rock crevices. They prefer to inhabit rocky outcrops and dry savannahs in high altitudes. Males are comparatively smaller in size compared to females. However females have a brighter pattern on their outer shell. The female can lay only one egg at a time. Pancake tortoise is listed as vulnerable under the list of endangered species. It is also popularly referred to as the African Pancake Tortoise as it mostly found in eastern Africa. The pancake tortoise is been listed under the vulnerable category on the IUCN Red List as well as the Conversation on International Trade in Endangered Species of Wild Fauna and Flora (CITES). 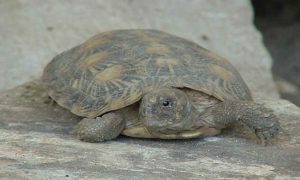 Sale of the pancake tortoise was banned in Kenya in the year 1981. The threats of over exploitation due to trade and destruction of their habitat are being constantly faced by the pancake tortoise. The unusually intriguing characteristics and appearance of these species have made them a popular favorite both in private and zoological collections. Moreover their low reproductive rate involves a longer period time in recovering these animals. The conversion of thorn scrubs into agricultural grounds in regions of Kenya and Tanzania has brought forward a matter of serious concern related to the natural habitat of the pancake tortoise.